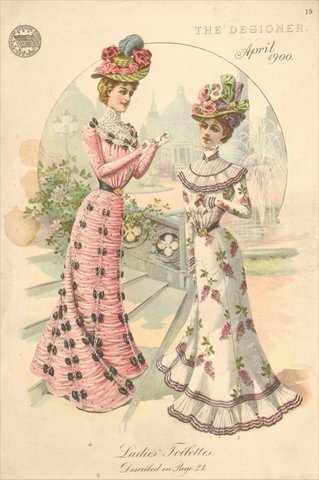 1900-1910 FashionIn the decade of 1900-1910, womens' fashion began to change from the recently passed Victorian era. Women began to wear more practical dresses, often tailor made, and the popuar 'female suits' were born. These were long skirts worn with a type of blazer (usually double-breasted). Rougher materials normally chosen for men became popular for everyday, but lighter cloths were chosen for formal occasions such as weddings. Embroidered bodices, bell-shaped skirts and bonnets were very fashionable. 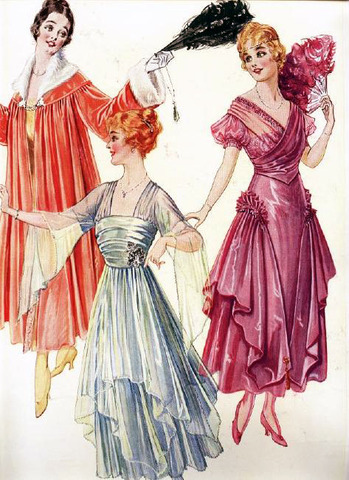 1910-1920 Fashion . During this decade, women were starting to lighten up with their fashion and wear more comfortable clothing. For example, bodices were worn to support instead of change shape, and dresses that rose above the ankle became popular. Lighter materials were used to create frills and artistic drapes on dresses and waistlines were risen. During the 1st World War, it was acceptable to wear dresses that rose well above the ankle, and women's "suits" were poular in wool or linen. 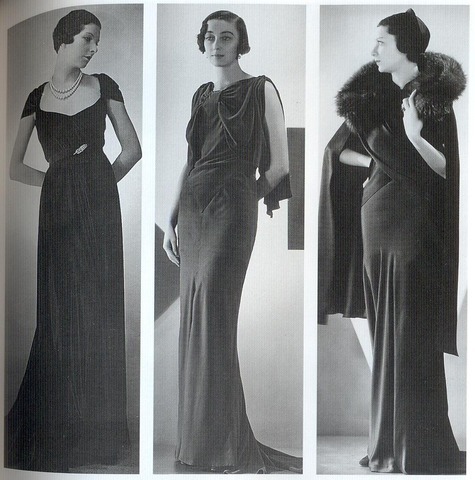 1920-1930 Fashion . 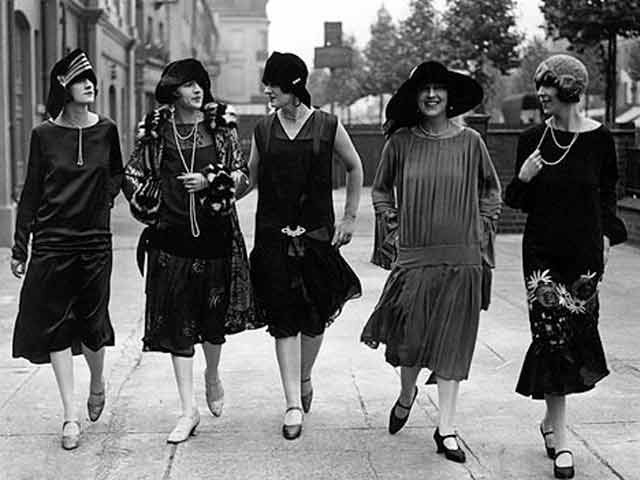 In the years between 1920-1930, different fashion began to evolve. When the 1st World War ended, fashion became simpler and more comfortable. V-neck collars became fashionable and skirt hems were risen even more! Beading and fur cloaks were popular for dances, as well as complex embroidery and seams. 1940-1950 Fashion. 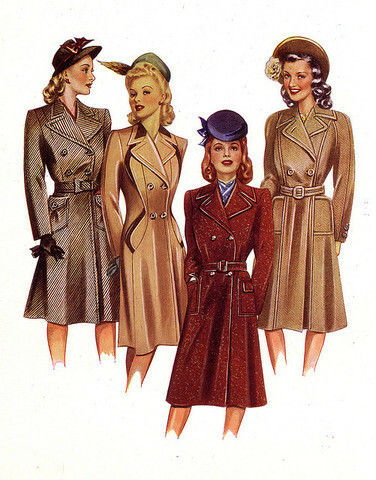 This decade was a major turning point for women's fashion - World War 2 changed clothing forever. Due to rationing, dresses were knee length and some women wore trousers to go to work. Curly hair and bright lipsticks were used. to stay looking feminine. 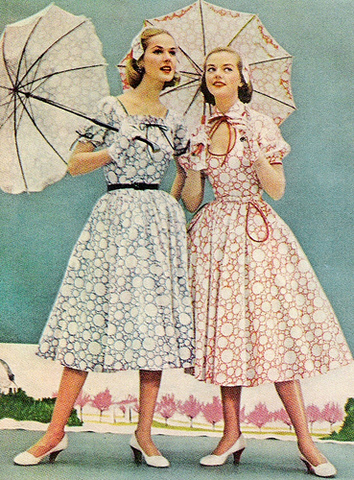 1950-1960 Fashion In this decade, fashion was very much shaped by Paris fashion houses. War shoulder pads and more manly clothes were replaced by Dior's full skirts, slim waists and rounded shoulders. Bright and girly coulours like pale pink, baby blue and sunshine yellow were popular. Teenages began to become interested in fahion, especially in America. 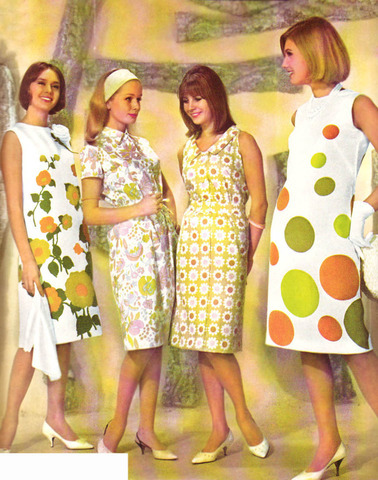 1960-1970 Fashion In the 60s, fashion changed in some ways that still effect today's fahsion. Teenagers became interested in fashion, and clothes became cheaper so that everyone could afford fashion. The flared A-line dresses in bright colours became hugely popular and some people chose the 'hippie' look when it came over from America. 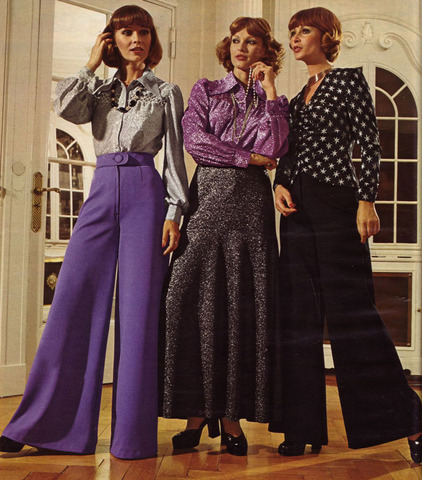 1970-1980 Fashion In the 70s, flared trousers became fashion must-haves and platform shoees were also popular. Some fashions were inspired by the 'hippie' look too. Smock tops and mini-skirts were fahionable along with mules and hotpants. Later in the decade, skinny or high waisted jeans were popular along with jersey wrap dresses and long, straight hair. 1980-1990 Fashion Women's fashion in the 80s was very funky and bright. Neon leggins, legwarmers and high-top trainers were very fahionable. Also, baggy blazers, jelly shoes and espadrilles were popular. Perms and big hair was a must-have and bright colours and heeled-shoes were fashionable.